AzhwAr says that even though emperumAn is such that he would grant whatever we ask of him, other than those who get rid of their desire for worldly pursuits and surrender to his divine feet, it is very difficult to attain paramapadham (SrIvaikuNtam). In order to attain the goal, shouldn’t one get an inkling about lowly matters that they are lowly and attainable matters that they are to be attained? In the previous pAsuram, AzhwAr mentioned about the help that emperumAn rendered to one (prahlAdha) who had desire towards him. In this pAsuram, he says that desire is the only one which is required. uNdAmO – will it be available? Unak kurumbaiyin uL pukku – reaching up to the point where faults are located inside the body which is having abundance of faults. Isn’t the body made of flesh! Doesn’t body, looking at it superficially, appear to be good to look at, hiding its qualities of being lowly, mean, unstable, worthless, disgusting, covered with a layer of skin to hide the inner features! Body is referred to as a hut since the body is like a hut for AthmA (soul). gyAnach chudal koLIi – lighting the lamp of knowledge. Knowing the characteristics of AthmA (soul) as they are, enabling knowledge about emperumAn, forgetting about self which is an attribute and focussing on emperumAn who is the substrate [holding the attribute]. The characteristic of AthmA is not something which is formed at one point of time and removed at another. It is there always. If it is hidden, thoughts seeking other benefits [instead of service to emperumAn] and about other means [instead of emperumAn’s divine feet] will come on their own. nAL dhORum maruvAdhArkku uNdAmO vAn – will paramapadham (SrIvaikuNtam) fructify for those who do not worship at the divine feet of emperumAn who transformed himself in order to protect his possessions (when he protected earth by transforming himself as varAha, the boar) unlike those who try to save themselves when their possessions are being destroyed? 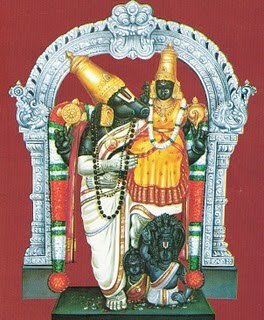 nAL dhORum – would SrIvaikuNtam be attainable for those who do not think everyday ,with total focus, of the divine feet of emperumAn who dug out the earth during his incarnation as varAha? UzhiyAn – he protects us even during deluge, when we are not there and he is present. An incident is quoted here about periya kOyil dhAsar, who was a disciple of nanjIyar (AchAryan of nampiLLai, who is the commentator for this prabandham). periya kOyil dhAsar, who had surrendered to the divine feet of nanjIyar, did not come to nanjIyar for many days. One day he came to nanjIyar and heard a few good words. One of the persons present there at that time, told dhAsar “it has been a long time since you came here” to which dhAsar responded saying “isn’t my goal a certainty when I attained the divine feet of nanjIyar? My loss is a few days when I did not see him in-between” The person (who spoke to him first) realised that dhAsar has given up the habit (and the faith due to that) of coming to his AchAryan everyday and listening to his good words. He asked dhAsar “has not AzhwAr mercifully sung the pAsuram ‘nAL dhORum maruvAdhArkku uNdAmO vAn?’. Have you not heard of this pAsuram?’ You do not speak like someone who has seen the difference of having worshipped at the divine feet of nanjIyar for a few days”. While atonement has been mentioned [in sacred texts] for those who, out of ignorance, miss a step when carrying out their karma (deeds, both good and bad), has it been stated that emperumAn can be attained even by those who do not have a desire in attaining him? Would a person, who has once surrendered to emperumAn but who goes about his usual ways in pursuing worldly matters in samsAram [after this act of surrendering], get his desired benefit? He had missed out on the benefit [of carrying out service to emperumAn] not because he had no qualification for it but because he had not desired it. In order to enjoy emperumAn, it is not that only chEthana (sentient entity) is required; the desire [by chEthana] is also required. When obtaining such a huge benefit, shouldn’t at least desire be there? Let us consider the 92nd pAsuram next. This entry was posted in iyaRpA, mudhal thiruvandhAdhi on September 9, 2017 by T N Krishnan.